Squash developed from at least five other sports involving rackets, gloves and balls with roots going as far back as the early 1500's in France. The game that we know and play today started in 1864 at Harrow, a school in England, but they adopted the game from Fleet Prison in London. The first squash court in North America appeared at St. Paul's School in New Hampshire in 1884. In 1904 in Philadelphia, Pennsylvania, the earliest national association of squash in the world was formed as the United States Squash Racquets Association (USSRA), now known as US-Squash. This version of the game used a hard ball, and became known as 'hardball' squash. In the UK, it was not until the 1920's that the 'Royal Automobile Club' (RAC) hosted a meeting and defined the game of 'softball' squash, and the English 'Squash Rackets Association' (SRA) was formed soon after. In America, the 'hardball' version of squash was deprecated in favor of the 'softball' (international) version of the game in the 1990's. Now squash is growing in the USA at the high school, university and international levels - the US now has several players in the world top 50. The detailed FULL history of squash. Squash is a popular international game and it's easy to understand why. It is an energetic game perfect for both beginners and experts, because it's simple to pick up for a beginner (anyone can hit a ball against a wall) and a challenge to master. Squash provides an exciting alternative to tennis, badminton and racquetball, often combining the best elements of all these games. Squash has a quick learning curve and many people find themselves hooked after just one short game. As an indoor sport it has the added attraction of being completely independent of weather conditions. One of the main attractions of squash is that it provides an excellent cardiovascular workout. Most players will get all the exercise and enjoyment they need in just a couple of squash games per week. A player may expend from 600 to 1000 calories (2.5 to 4.2 kJ) per hour, which is significantly more than most other sports and over 70% more than either general tennis or racquetball. Combining that physical workout with the tremendous strategical battle that occurs between the players (squash is often described as 'playing chess at 100mph') made squash the sport of choice for the British army and airforce. Being an indoor game (so uneffected by the weather) and only requiring a small area and little equipment, squash was easilly transported around the world by the army. Forbes magazine compiled a list of the 'Ten Healthiest Sports' and guess which one came out on top - SQUASH ! The sports were (in order): Squash, Rowing, Rock Climbing, Swimming, Cross-country Skiing, Basketball, Cycling, Running, Modern Pentathlon and Boxing. I've been playing squash since 1977 (roughly, I think). 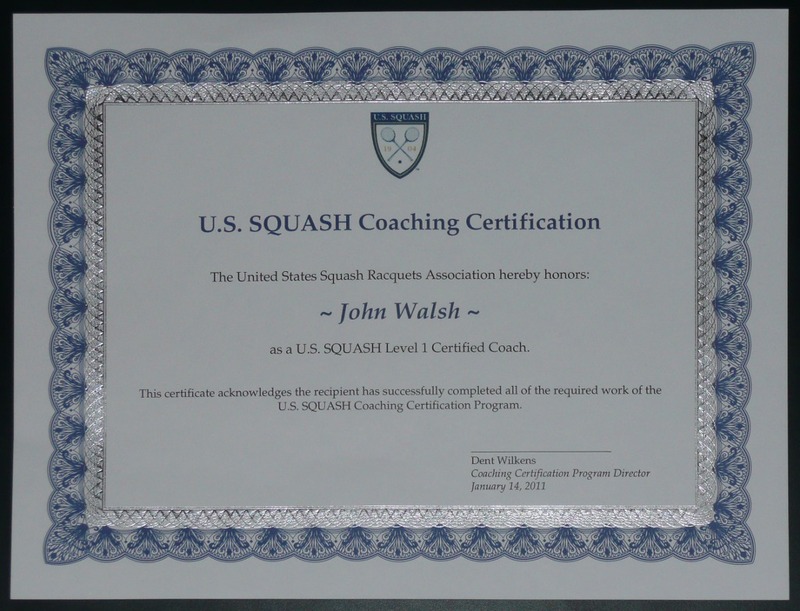 US Squash Level 1 Certified Coach. currently based at the Harro East Athletic Club in downtown Rochester. helped form the University of Rochester ladies squash team. formed and coached the University of Reading (UK) ladies squash team for two years (before moving to Rochester). played for and helped run the Reading University Squash Club in the UK, organising the graded squash tournament from 2005 to 2008 (before moving to Rochester). See my old UK squash clubs website. squash coach on a holiday camp for children (aged 11 - 16) in the UK. played on and captained several club squash teams around the UK for many years. played for and captained the University of Reading (UK) squash team over several years. Tip 12/15: Be prepared to make mistakes while you are learning.